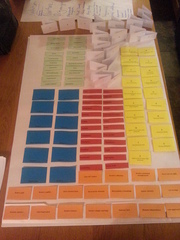 A workshop method for freeform creation in which the players help create their own characters by selecting from sets of cards that represent different aspects of their character. This enables players to personalise and give their characters emotional and motivational depth. The cards are created to fit into the freeform's general setting. For example, one set of cards can be character archetypes, another set roles, another personality traits, another emotional goals, another secrets. Plot elements can also be added into the game as cards to be selected in this way. Each set of cards is printed on differently coloured card. 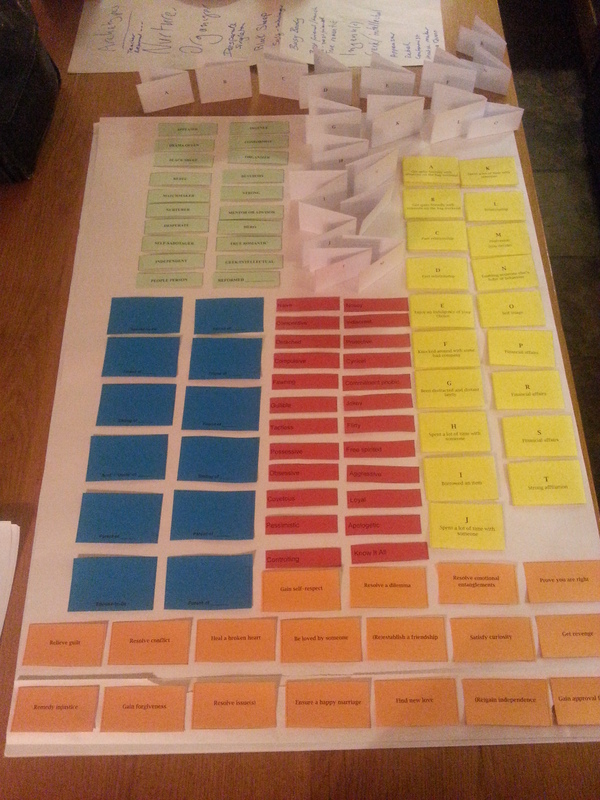 The sets are laid out on a table and players can have a brief look at what's available. Players then take it in turns to pick one card from any of the sets, in any order. Then they each choose another from a different set, and continue until everyone has one card from each set. Then all players sit down in a circle or at a table and display their cards except their emotional goals and secrets, which are private. The GMs guide them through a series of questions which enable players to form connections and relationships between their characters. This process typically takes up the first hour or so of the game. After this, the freeform itself begins. Some games may include an interlude after some playing time so that players can gather for further workshopping and questions, such as to consider how their character's relationship with other players may have changed as a result of what has gone on so far. This approach was designed to lead to a more dramatic and potentially more involving style of play, and builds on approaches drawn from Nordic freeform and modern storytelling and dramatic roleplaying games such as Hillfolk by Robin Laws or Fiasco by Jason Morningstar.